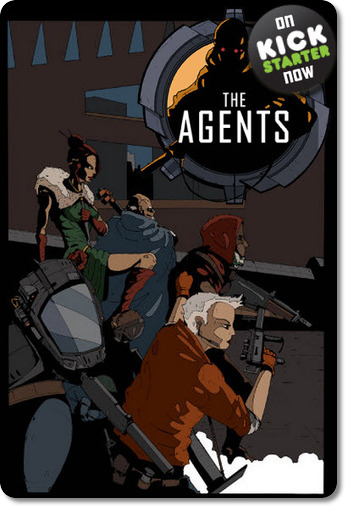 In this segment, Marty and I review a prototype copy of the card game The Agents, which is currently on Kickstarter. The game is a card game, plus on my side because I love card games, that involves a lot of interaction between players. In the game, you are trying to score 40 victory points before you opponents by playing Agents in a shared area known as the Faction. Factions are shared between the opponent to your left and the opponent to your right. So, you are sharing two sets of cards (factions). This concept is very important to the game for it provides one of the means to score points and causes interaction in the game between players. You also have missions that score points and these missions are only for you. So you must balance between your factions and missions to secure victory. Marty spends the first part of the episode discussing the rules and you can get them here. One thing we forgot to mention in our discussion is that drawing cards from the draw piles is not automatic, you have to spend victory points in order to draw cards so you are having to judge when to give up points to get cards. Another nice mechanism in this game to make you have to think. If you aren’t sure this game is for you, they have the print and play ready to go along with the rules, so give it a try. This game has been backed by RDTN and we look forward to receiving our copy.